Wales forward Natasha Harding says she does not bear any grudges towards Manchester City following her release. Harding, 26, only joined City in March 2015 after a switch to Washington Spirit in the United States fell through when she was denied a visa. 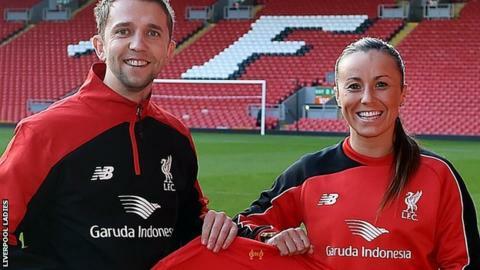 But she left the club in January and has since signed for Women's Super League rivals Liverpool. "I was happy at Manchester City. I'm not going to lie - I was disappointed (to leave)," she said. "I have fond memories of my time there. But it's in the past now so I've got to leave it behind and look forward to the future". Harding spent five years at Cardiff City before switching to Bristol Academy in 2012 and following a short spell at Manchester City is now looking forward to the challenge of playing for Liverpool. "I've joined a huge club. It's on the same level as Manchester City and probably has more history," Harding told BBC Wales Sport. "When one door closes another one opens and fortunately Liverpool wanted me. As soon as I knew they were interested I wanted to come here." Liverpool were champions in 2013 and 2014, but finished seventh in the Women's Super League last season. The Reds host Birmingham City in their opening game of the season on 23 March and Harding believes another title is not beyond their grasp. "I want to win things. That's why I came here. The manager has strengthened the squad and I'm excited by the prospect of what we can achieve this season," Harding said. "I think that we'll be a force to be reckoned with". Wales are third in their qualifying group for Euro 2017 after defeats to Austria and Norway, a win over Kazakhstan and a draw in Israel. But Harding, who has scored three goals in the campaign, believes they can still qualify for the 2017 finals in The Netherlands. The eight group winners and the six best runners-up qualify directly for the final tournament, while the two remaining runners-up advance to the play-offs. "We have to keep the faith. If we could get a good result against Kazakhstan in our next game, that would be a boost," Harding said. "Then hopefully we'll be able to get some positive results in the games against Austria and Norway at home. "If we can take the positives from the other games and not concede as many goals then it's still possible. "Qualifying will be hard. But if you want to get to a major championship you have to beat the best teams." Jayne Ludlow's side .face Kazakhstan away on 12 April before they complete the campaign with three home games.